Rivers Agency is a leading mobile app development company that builds mobile apps users want to explore with a sharp UX design and cutting-edge technology that elevate brands and make campaigns click more than ever. You have ideas. We have the expertise and insight to build on your ideas and transform your business. In a mobile-first world, we know your brand, product or campaign needs to be viable on mobile devices. That’s where we come in. Rivers Agency is a full service mobile app development company in the Raleigh, Durham and Chapel Hill, North Carolina area. Our multifaceted team of mobile app developers, designers and strategists are committed to expanding your brand to iOS and Android devices through refined, result-driven techniques and out-of-the-box solutions. We know your business needs to get noticed. As one of the best mobile app development companies, we are not afraid to do things differently. We meet curiosity with creativity to help you build the best mobile apps that people love to use. From UX designers to back-end development and support, we bring the knowledge and skills required to create truly custom experiences for your users with creative strategies and execution that will set you apart from your competition. Our mobile app development process has been tested and guaranteed to produce a high-quality mobile app built on equal parts creativity and innovation. We start with a blank-canvas approach to bring your idea and scope to the forefront of our development process. At Rivers, we take the time to learn and understand your business model, so that we can navigate our development process with your brand’s vision in mind. We integrate top-of-the-line UI/UX design strategies paired with an extensive coding process to launch a brand-centric mobile app that is rich in performance, speed, interactiveness and functionality. After your mobile app goes live, our development team remains accessible and communicative for maintenance, updates and technical support. Rivers Agency is composed of more than just a team of mobile app developers and designers. We are out-of-box-thinkers, rule-breakers and risk-takers. We are committed to building creative strategies to develop a mobile app that aligns with your brand, elevates your business and stands out from the rest. Our app development strategy ensures that you get the detail-oriented app your brand needs to win. Before starting your mobile app development project, read our guide to the six questions you should ask a mobile app development company. Our mobile app development team is staffed with the most skilled technicians in the Raleigh, Durham and Chapel Hill, North Carolina area. 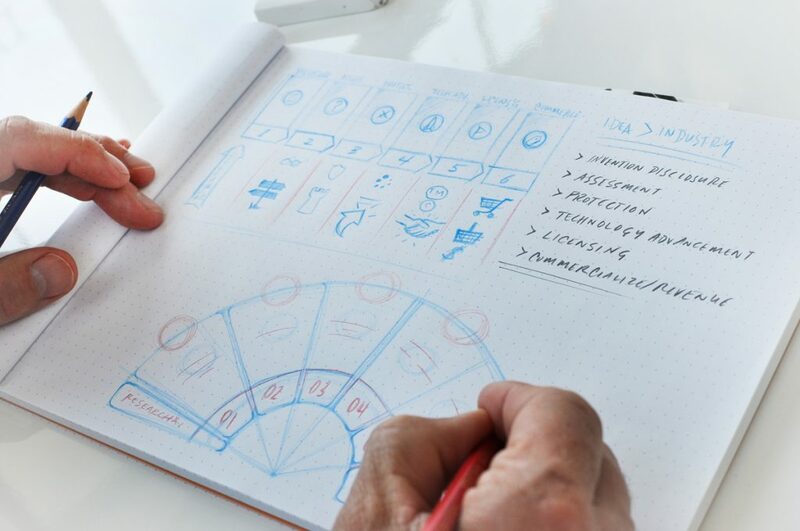 From wireframes and prototypes to development and launch, our technicians give hands-on support when it comes to every step of the app development process. When it comes to design, our skills, talent and sheer creativity are unprecedented. We use a complex approach to develop the best user-centered UI design in the Raleigh, Durham and Chapel Hill, North Carolina area with our visually stunning designs and interactive interfaces. Our UI design team collaborates with you to create designs that resonate with your aesthetic, engage your users and promote your brand. Our UX designers match our UI design team’s high standards with the skills to create mobile apps that are fluid, accessible, useful and interactive. We know there are a lot of designers out there who can design an app for your business, but our team crafts flawless designs that add substance and meaning to your business model. At Rivers Agency, we have the expertise, talent and creativity to develop a mobile app that revolutionizes the way your customers experience your brand. We know that graphics are an integral part of any digital platform and play a significant role in driving results. Our graphic designers are devoted to collaborating with you to build creative graphics that strengthen your user’s visual experience and expand your brand’s digital identity. We help your brand extend its message. Our copywriters craft compelling and informative content with a flair of creativity to make sure your business model educates, engages and resonates with your customers. Rivers Agency is a team of adaptable communicators who are devoted to telling your story and giving your brand’s narrative an unparalleled voice. You can’t have a mobile app development company without exceptional coders who build mobile apps from scratch. Our coders are equipped with the prowess to bring your idea to life. Our mobile app developers hold a rich set of IT skills to provide end-to-end services to develop an app that will bring your brand to the forefront of your field. What good is a state-of-the-art app if it can’t be integrated into your existing business systems? We know that your app must have the adaptability to fit smoothly into your brand. At Rivers Agency, we analyze your brand’s mission and offer integration support to ensure that the app we create is not only customized for your business and tailored to your customers, but also is seamlessly integrated into business practices you already have. At Rivers Agency, we take our client relationships seriously, and that means our technical support doesn’t stop once your app goes live. We provide around-the-clock technical support so that your mobile app remains unrivaled long after launch. We made the nation’s very first art events app built for a university. Arts Everywhere makes it simple to discover and learn about the arts in the UNC Chapel Hill area and promotes a culture of creativity, all from a mobile device. Carol Folt, chancellor of the University of North Carolina at Chapel Hill, came up with the idea for the Arts Everywhere app to give the UNC community a resource to feed their need for creativity by making the arts accessible to everyone. After getting to know our talented team of app developers and designers, Chancellor Folt partnered with Rivers Agency to build her idea into an interactive app and bring her vision for a more creative and artistically-connected community to life. The app fosters an environment where the arts are accessible and take precedence in experiencing a fulfilled and meaningful life. Available on both iOS and Android devices, Arts Everywhere is UNC’s campus-wide app that connects UNC students, teachers, faculty and alumni by providing users with an interactive resource to find and engage with creative events in the UNC-Chapel Hill area. The interactive design is completely customizable, allowing the user to create a personalized feed of events, discover new artists and genres, save favorite events, connect with friends in the area and invite people to events. Not only is the app the first of its kind, but Arts Everywhere has also created a unique space within university communities where creativity can flourish and grow and where individuals can create, share and engage.